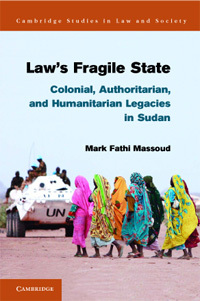 The book Law’s Fragile State: Colonial, Authoritarian, and Humanitarian Legacies in Sudan (Cambridge University Press, 2013), by Mark Fathi Massoud, assistant professor of politics and legal studies at UC Santa Cruz, has received the Law and Society Association's Herbert Jacob Prize for the best book in law and society published in 2013. The award will be presented at the association's annual conference in Minneapolis at the end of May. Cambridge University Press is scheduled to release Law’s Fragile State in paperback next month. Massoud is the second UCSC professor to receive the prestigious book award. The first was Craig Haney, professor of psychology and legal studies, who was a co-winner in 2006 for Death by Design: Capital Punishment As a Social Psychological System. Separately, the president of the LSA is UCSC alum Carroll Seron, (Cowell, '70, American Studies). She is currently professor and chair in the Department of Criminology, Law & Society at UC Irvine where she holds a joint appointment in sociology and the school of law. Previous coverage of "Law's Fragile State"